The Timer1 module is a 16-bit timer/counter within most PIC® MCU devices. Timer1 can increment up to a value of 65535 before it overflows back to zero. Because the timer is built into an 8-bit device, the 16-bit timer register is broken into two 8-bit registers and increments similar to an 8-bit timer with 8-bit prescaler. Timer1 has other features built-in that make it very useful for applications. Timer1 is also used as the time base for the Capture/Compare function. The Timer1 16-bit incrementing counter is accessed through the TMR1H:TMR1L register pair. These registers can be updated with writes to the TMR1H or TMR1L registers directly to preload the timer. Timer1 is incremented by either the system clock, instruction clock or an external clock signal. When used with a system or instruction clock source, the module is a timer and increments on every instruction cycle. When used with an external clock source, the module can be used as either a timer or counter and increments on every selected edge of the external source. Timer1 must be enabled to operate which is done by setting the Timer1 On (TMR1ON) bit in the Timer1 Control (T1CON) register. This starts incrementing the counter on each pulse from the selected clock source. Timer1 also has a prescaler that offers four options allowing 1:1, 1:2, 1:4 or 1:8 divisions of the clock input. The Timer1 Clock Prescaler (T1CKPS) bits of the T1CON register control the prescale counter. The prescale counter is not directly readable or writable; however, the prescaler counter is cleared upon a write to TMR1H or TMR1L. The Timer1 Gate feature allows the PIC MCU device to easily time external events using T1G pin as the input or analog events using an internal Comparator. This can be useful for timing the high pulse time of a waveform. The Timer1 Gate can control when the Timer1 increments. It is essentially an on/off switch for the Timer1 counter. There are several individual bits in the Timer1 Gate Control register (T1GCON register) that control the operation of the Timer1 Gate. Each setting is covered below. The Timer1 Gate is enabled by setting the Timer1 Gate Enable bit (TMR1GE bit) of the T1GCON register. This enables control of the Timer1 count from an external source such as the T1G I/O pin or several other sources. 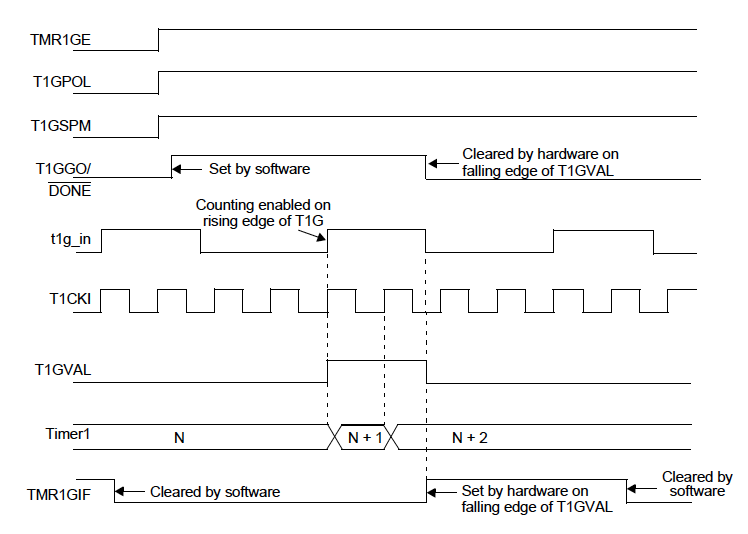 The Timer1 Gate Value Status bit (T1GVAL bit) indicates when the Timer1 is active by being set high or a 1. When the gate control halts the Timer1 operation, then the T1GVAL bit will clear. The polarity of the Timer1 Gate is configured using the Timer1 Gate Polarity bit (T1GPOL bit) of the T1GCON. Setting this bit high will enable Timer1 counting when the T1G pin is also high. Setting this bit low will enable Timer1 counting when the T1G pin is low. The two bits preceding the selections above are the two Timer1 Gate Source Select bits (T1GSS bits) of the T1CON register that select the control option. Both Comparator outputs can start or stop the Timer1 count based on the output signal level as it compares to the Timer1 Gate polarity setting. When the output matches the polarity setting, the Timer1 count will increment on its clock source signal. When the output is opposite the polarity setting, then the Timer1 count is halted. The Timer0 overflow will send a high signal to the Timer1 Gate circuitry when Timer0 overflows from FFh to 00h. The Timer1 Gate Polarity setting will determine if the Timer1 starts to count (T1GPOL = 1) on the overflow signal or stops (T1GPOL = 0) on the overflow signal. The T1G pin is a direct source for Timer1 gate control. It can be used to supply an external signal to control the Timer1 operation. Timer1 Gate also has the option of a Toggle Mode. Timer1 Gate Toggle mode is enabled by setting the Timer1 Gate Toggle Mode bit (T1GTM bit) of the T1GCON register. The Toggle Mode allows the Timer1 control to be based on alternating control signals. When the Timer1 Gate control signal matches the polarity setting, the Timer1 will start incrementing. When the Timer1 Gate control signal toggles to the opposite polarity, the Timer1 will be allowed to continue incrementing until the Timer1 control signal matches the polarity a second time. At that point the Timer1 will stop incrementing and hold the value. This allows the Timer1 to measure the period of an alternating signal. Timer1 Gate Single-Pulse Mode enables the time capture of a single-pulse event. Timer1 Gate Single-Pulse mode is first enabled by setting the Timer1 Gate Single Pulse Mode bit (T1GSPM bit) in the T1GCON register. Next, the Timer1 Gate Go/Done bit (T1GGO/DONE bit) in the T1GCON register must be set to a 1. The Timer1 will begin counting on the next incrementing edge of the Timer1 Gate Source signal thus beginning the measurement of a pulse. On the following trailing edge of the pulse being measured, the T1GGO/DONE bit will automatically be cleared and the Timer1 count will be halted. The TMR1 register will contain the pulse width time measurement in timer counts. No other gate events will be allowed to increment Timer1 until the T1GGO/DONE bit is once again set in software so the application can retrieve the value from the TMR1 register. bit should also be cleared. Enabling the Toggle mode and the Single-Pulse mode simultaneously will permit both sections to work together. This allows a full cycle to be captured and then the Timer1 halted with the total period time of the waveform. An interrupt can be generated by the Timer1 Gate structure. The Interrupt is based on the T1GVAL bit in the T1GCON register. When the falling edge of T1GVAL occurs, the Timer1 Gate Interrupt Flag bit (TMR1GIF flag bit) in the Peripheral Interrupt Register 1 (PIR1) will be set. 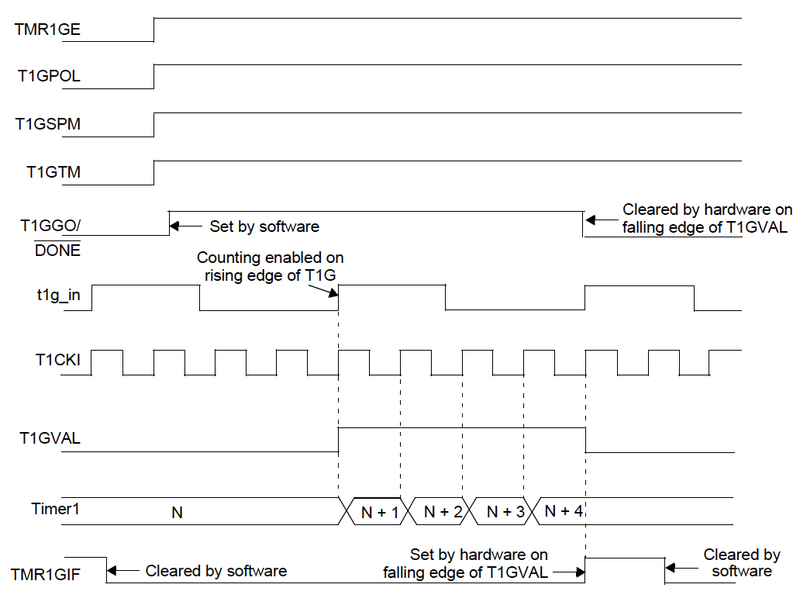 If the Timer1 Gate Interrupt Enable bit (TMR1GIE bit) in the Peripheral Interrupt Enable Register 1 (PIE1) is set, enabling the interrupt, then an interrupt will be recognized and a redirect to the interrupt service routine will occur. The TMR1GIF flag bit can be polled without enabling the Timer1 Gate interrupt, as the TMR1GIF flag bit operates even when the Timer1 gate interrupt is not enabled. Timer1 can trigger an interrupt when it overflows from FFFFh to 0000h. When Timer1 rolls over, the Timer1 interrupt flag (TMR1IF) bit of the Peripheral Interrupt 1 Register (PIR1) is set. Timer1 overflow can be monitored by randomly checking the TMR1IF bit. The interrupt is cleared by clearing the TMR1IF bit in the Interrupt Service Routine. The device will wake-up on a Timer1 overflow and execute the instructions following the SLEEP assembly command. The wake up from sleep can also drive the device to the execute the Interrupt Service Routine instead of the instruction following the sleep command. To enable this the Global Interrupt Enable bit (GIE bit) of the INTCON register needs to be set. The device will call the Interrupt Service Routine on wake-up. If the interrupt service routine contains a SLEEP instruction, the device will return to sleep mode. The service routine must also clear the TMR1IF prior to returning to sleep.